Dr. Blaine Mays was ordained a Unity minister in 1957. His service to Unity and to New Thought is so extensive that I dare not try to summarize his life and legacy here. So until a friend, family member or scholar writes a fitting biography, here are some resources about Blaine. Catherine Ponder has shared her recollections of Blaine and his family. You can read them here. 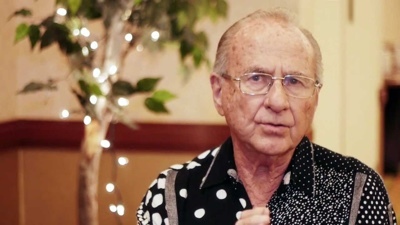 Watch a clip of Blaine Mayes on YouTube, courtesy of New Thought Movie. January 2018 update: Thanks to Ed Williams and the IAMU for publishing this profile of Blaine. 1. Why did you choose ministry as a vocation? As a teenager I was preparing for a career in theatre while being very involved in Dr. Sue Sikking's church, Unity by The Sea, Santa Monica. My Involvement included being president of the Youth of Unity, Superintendent of Sunday School, caring for children during the worship service, and volunteering on work projects. While Superintendent of the Sunday School, I would carry all needed materials to and from the movie theatre where the church met. In my senior year in High School, I wrote a book I titled "The Next Step" in which I attempted to cover the history of the Unity organization and present its teachings. This was fairly easy for me since I was exposed to Unity all of my life, beginning with the reading of "Wee Wisdom" to me by my mother. The book was professionally bound in white leatherette with gold lettering. In 1950, Ralph Rhea, who was co-director of Unity Headquarters Field Department, was speaking at Dr. Sue's church. At a gathering in Dr. Sue's home, somehow, the discussion got around to talking about my involvement in the church, which prompted Ralph's comment: "You should go into the ministry". I had never thought about entering the ministry. I told Ralph that I had just won the lead in a local musical and had a scholarship to USC. He responded that the ministry would lose me if I went to the University. I gave serious thought to the possibilities and potentials of my future. It did not take me long to decide to apply for ministerial studies based in the evaluation that all of my friends in the private school I attended were also pursuing careers in theatre. I was aware that work in theater was occasional. Out of all on my friends, I can only think of three of them that attained status known as known movie and television stars. All of a sudden, the ministry seemed like more of a sure thing in developing a career along with marriage and raising a family. So, I applied for, and entered the Unity Ministry on-campus School immediately upon graduation from High School. While working and studying at Unity Headquarters, I met and married my wife, Betty, who was a member of Silent Unity. We had four children resulting in three grandchildren and three great grandchildren. Betty was very involved in the Unity ministries I served. She was also very involved in the service to the International New Thought Alliance over that past 40 years as well as the Lola Pauline Mays New Thought School of Ministry, with over 300 graduates world-wide, of which I am Dean. Our marriage fell short a few days in reaching 60 years. 2. How can ministers support through the iamb support services? By making it known that Unity ministers are available with absolute non-judgmental support. 3. What is your most joyful experience from ministry? An ongoing awareness that I am sharing the tools for individual transformation that will ultimately transform each member of the family of humanity. 4. What has been your greatest challenge in ministry? Having the courage and conviction to say "No'." 5. What would have been helpful to know as a new minister? That I am a spiritual being having a human experience in a world greatly influenced by limiting human thought. 6. What is one item of wisdom that you would like to share? Ministry comes easy if you love what you do. 01 Who were your mentors? 24 Why is the INTA relevant today? 25 What is New Thought? 26 Who is Joseph Murphy? 27 What is the Community Church of New Thought? 28 Are there other CCNT churches? 30 What is taught at the seminary? 33 Can one do ministry without affiliating with a denomination? 35 How has ministry changed? 39 What is the INTA archives? 40 How is the INTA archives funded? 41 What is in the INTA archives? 45 Who have we not talked about? If you have been blessed by the content of this page or the work of the Mays family, why not consider a tithe to The Community Church of New Thought?